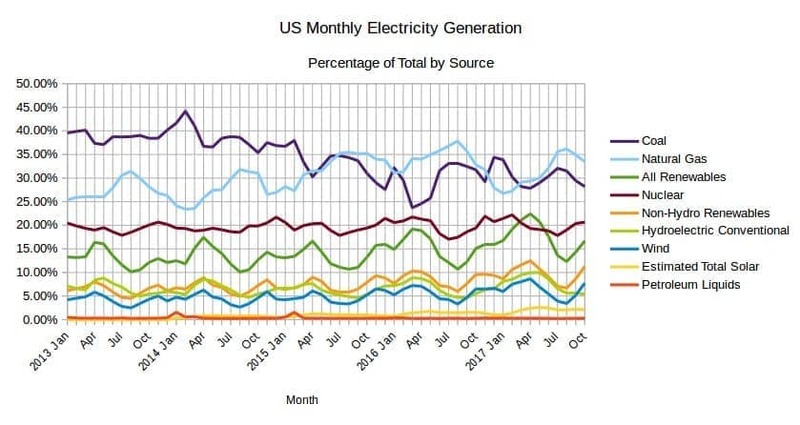 The EIA released the latest edition of their Electric Power Monthly on December 22nd, with data for October 2017. The table above shows the percentage contribution of the main fuel sources to two decimal places for the last two months and the year to date. 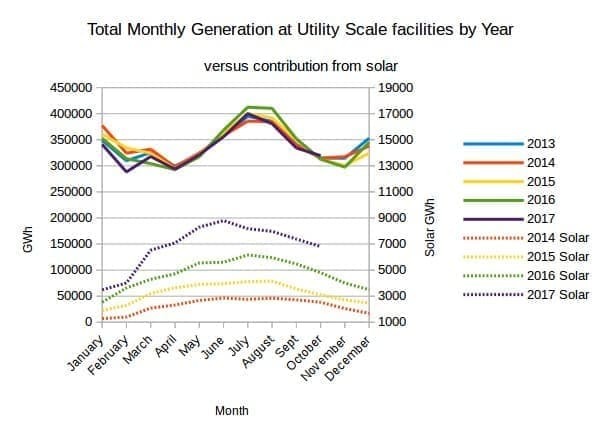 The graph below shows the total monthly generation at utility scale facilities by year versus the contribution from solar. The left-hand scale is for the total generation, while the right hand scale is for solar output and has been deliberately set to exaggerate the solar output as a means of assessing it’s potential to make a meaningful contribution to the midsummer peak. This October the output from solar continued to decline heading into the winter solstice. However, with solar capacity growing rapidly it can be expected to generate significantly more over the approaching winter season than was generated last winter, repeating the pattern of the past few years. The graph below shows the monthly capacity additions for 2017 to date. 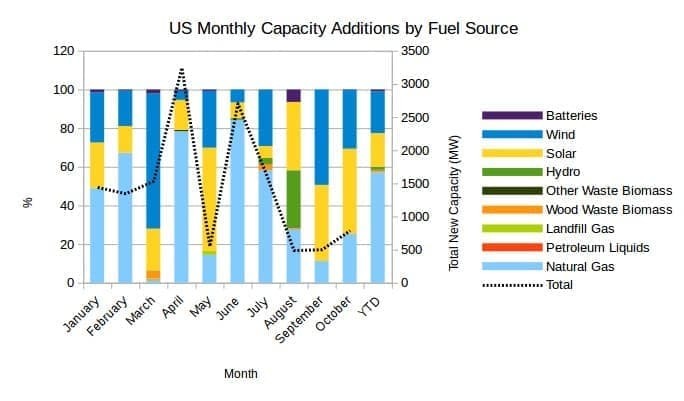 In October 27.3 percent of capacity additions were Natural Gas. Solar added 44 percent and wind contributed 30.4 percent of new capacity. Petroleum Liquids and Batteries each had relatively minor capacity additions of 0.13 and 0.25 percent respectively. In October the total capacity added was 791.6 MW the fourth lowest monthly figure for the year so far, the months with lower amounts being May, August and September.